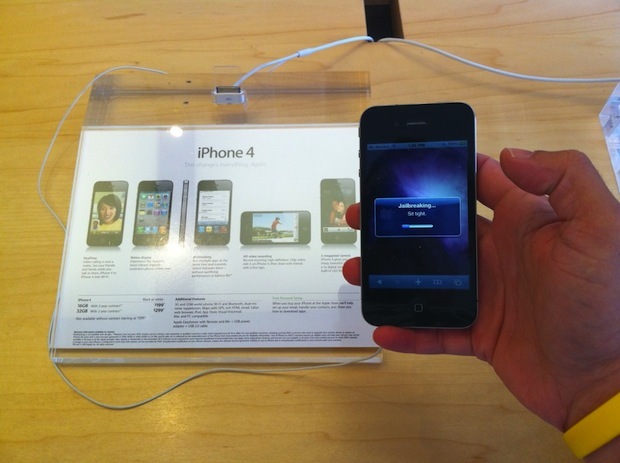 In an effort to stop the pranksters from tampering with display iPhones, Apple has issued a ban on the popular jailbreak website JailbreakMe.com inside its stores. No, if a user tries to visit the site, a DNS forward redirects the user back to the Apple website. With the PDF exploit available for a number of days, many people will be questioning why it took Apple so long to block access to the website. By blocking access, Apple could have inadvertently started a jailbreaking game of cat and mouse, with other websites looking to copy the exploit and serve it on their own domain. For example, ModMyI hosts its own version of the exploit. The JailbreakMe.com has been around since 2007, you would have thought Apple would have restricted access a little while ago. That said, it wouldn’t have stopped the jailbreaking community from getting its product to a mass audience.